The vice president of CareFusion Center for Safety and Clinical Excellence, Tim Vanderveen, stated that about 60% of all hospitals in the United States are not fully compliant with the Environmental Protection Agency requirements. He told that pharmacy technicians and pharmacists could be held liable for violations. Fred Massoomi, PharmD, Nebraska Methodist Hospital pharmacy operations coordinator, said that the first step to managing the issue of hazardous waste is to admit that the facility you work in has the issue, and the worst step could be taken is to not recognize that your facility produces hazardous waste. He pointed out it was easy to violate the regulations since in his hospital were about 400 licensed beds and about the same amount of places where hazardous wastes could be produced. He also explained violations to be some kind of legacy of previous practices, like sewering of wastes (which now could be considered as hazardous wastes by EPA). In his words, every, who involved in healthcare, should think about hazardous drug wastes, not only pharmacy, since it is not only pharmacy issue. On the top of that, pharmacists are specialists who work with medications all the time and the responsibility for hazardous drug waste is the part of the responsibility. As for the United States, there are about 12 million of hazardous wastes generated annually, according to EPA report in 2008. However, Massoomi said that hospitals are seldom to violate Environmental Protection Agency regulations and their issue was that they simply do not realize their role in EPA regulation. He was involved, when his hospital was found in violation of Resource Conservation And Recovery Act regulations by the violation of cyclophosphamide waste procedure. Cyclophosphamide is a chemical put on U-list (hazardous) of EPA. The Department of Transportation; regulates the transportation of any kind of hazardous waste, including drug one and in a case of violation tracks the waste back. An official with Environmental Protection Agency Materials Recovery and Waste Management Division, Office of Resource Conversion and Recovery, Lisa M. Lauer, said that there were a few drugs qualified as hazardous waste (less than 5%). Drugs are considered to be hazardous is they present on of characteristics, which is usually typical for hazardous waste: corrosivity, toxicity, reactivity, ignitability. In other cases, drugs could be on the list of EPA hazardous chemicals. Other commonly wasted drugs, considered to be hazardous are warfarin, some of chemotherapeutics, nicotine and some other common drugs. Lauer added that drugs used for their purpose are not considered to be a hazardous waste. As well as unused medications, drugs containers are also hazardous, if they contain the residue of the medication. In this case, hospitals have a big issue, according to Lauer: containers are the hazardous waste as well as water that was used to rinse them, so hospitals need to choose what to consider and so treat as hazardous waste in their case. According to Lauer, almost each state has its own hazardous waste program and EPA just setting the baseline for regulations. In some cases, the policy of a state is even more strict than EPA regulation. Beside of that, in some cases, EPA makes hazardous waste managing even less strict for health care providers. For example, Warfarin has different handling requirements depending on its quality: if warfarin is less than 0.3% quality, it is on the U-list of EPA (hazardous), if warfarin residue is more than 0.3% it will be in EPA P-list (acutely hazardous) and should be handled another way. 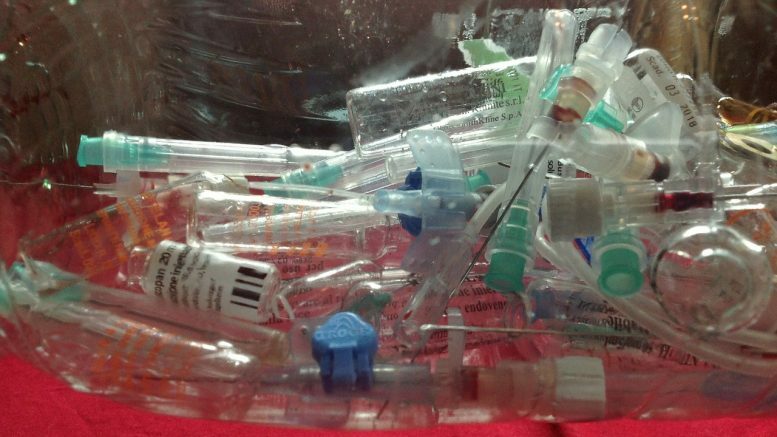 Another example is syringes, which are not hazardous waste anymore, according to EPA. Unfortunately, inappropriate handling of almost any amount of hazardous waste still can be a reason for a five numbers hospital penalty. Lauer warned that it will be more expensive to be found without a hazardous drug waste program running than getting and run the program in any case. She also added that next proposal of hazardous waste rules would be available for public comment in 2013 and till then EPA would be inspecting hospitals for regulations violations. Be the first to comment on "Hazardous Pharmaceutical Waste Violations By Hospitals"